(Nanowerk News) You've heard about flower power. What about tree power? It turns out that it's there, in small but measurable quantities. There's enough power in trees for University of Washington researchers to run an electronic circuit, according to results to be published in an upcoming issue of the Institute of Electrical and Electronics Engineers' Transactions on Nanotechnology. "As far as we know this is the first peer-reviewed paper of someone powering something entirely by sticking electrodes into a tree," said co-author Babak Parviz, a UW associate professor of electrical engineering. Electrical engineers Babak Parviz and Brian Otis and undergraduate student Carlton Himes (r-l) built a circuit that runs entirely off tree power. A study last year from the Massachusetts Institute of Technology found that plants generate a voltage of up to 200 millivolts when one electrode is placed in a plant and the other in the surrounding soil. Those researchers have since started a company developing forest sensors that exploit this new power source. The UW team sought to further academic research in the field of tree power by building circuits to run off that energy. They successfully ran a circuit solely off tree power for the first time. Co-author Carlton Himes, a UW undergraduate student, spent last summer exploring likely sites. Hooking nails to trees and connecting a voltmeter, he found that bigleaf maples, common on the UW campus, generate a steady voltage of up to a few hundred millivolts. The UW team next built a device that could run on the available power. Co-author Brian Otis, a UW assistant professor of electrical engineering, led the development of a boost converter, a device that takes a low incoming voltage and stores it to produce a greater output. His team's custom boost converter works for input voltages of as little as 20 millivolts (a millivolt is one-thousandth of a volt), an input voltage lower than any existing such device. It produces an output voltage of 1.1 volts, enough to run low-power sensors. The UW circuit is built from parts measuring 130 nanometers and it consumes on average just 10 nanowatts of power during operation (a nanowatt is one billionth of a watt). "Normal electronics are not going to run on the types of voltages and currents that we get out of a tree. But the nanoscale is not just in size, but also in the energy and power consumption," Parviz said. "As new generations of technology come online," he added, "I think it's warranted to look back at what's doable or what's not doable in terms of a power source." Despite using special low-power devices, the boost converter and other electronics would spend most of their time in sleep mode in order to conserve energy, creating a complication. "If everything goes to sleep, the system will never wake up," Otis said. To solve this problem Otis' team built a clock that runs continuously on 1 nanowatt, about a thousandth the power required to run a wristwatch, and when turned on operates at 350 millivolts, about a quarter the voltage in an AA battery. The low-power clock produces an electrical pulse once every few seconds, allowing a periodic wakeup of the system. The tree-power phenomenon is different from the popular potato or lemon experiment, in which two different metals react with the food to create an electric potential difference that causes a current to flow. "We specifically didn't want to confuse this effect with the potato effect, so we used the same metal for both electrodes," Parviz said. Tree power is unlikely to replace solar power for most applications, Parviz admits. But the system could provide a low-cost option for powering tree sensors that might be used to detect environmental conditions or forest fires. The electronic output could also be used to gauge a tree's health. "It's not exactly established where these voltages come from. But there seems to be some signaling in trees, similar to what happens in the human body but with slower speed," Parviz said. 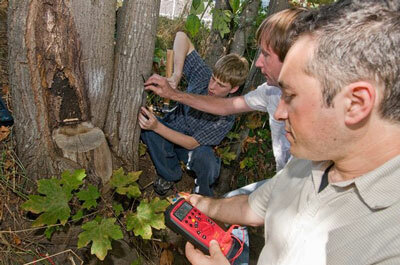 "I'm interested in applying our results as a way of investigating what the tree is doing. When you go to the doctor, the first thing that they measure is your pulse. We don't really have something similar for trees."